Wyoming QB Nick Smith looks downfield to throw a pass in last season’s home loss to Fresno State. (Photo courtesy of Wyoming Athletics). Wyoming spring football is here. Footballs will be flying through the air today in Laramie, with the first of fifteen practices that will conclude on April 20th with the annual Spring Game. As you may have heard (canned laugh), Josh Allen is headed to the NFL after the completion of his junior season. That leaves the quarterback position open this spring with Nick Smith and Tyler Vander Waal competing for the job. Nick Smith a senior from Florida, has started 4 games and has played in a total of 12 games in his career backing up Josh Allen and Cam Coffman the past three seasons. His record as a starter is 0-4 including the late-season road loss in 2017 against San Jose State. From what we have seen, Smith hasn’t developed as much as the fans (and perhaps the coaching staff) would like. Still, he’s entering the competition as the number one quarterback based on his limited playing time and the fact that he is a senior. A redshirt freshman from the opposite coast (California), Vander Waal has a lot of the physical attributes the Wyoming staff likes in a QB. Vander Waal is fairly mobile and has a pretty strong arm, although not at a Josh Allen level. Vander Waal was on the scout team last season and to get any evaluation on him you have to go back to his high school film. There you will see a QB with a skill set similar to Josh Allen’s but looks more apt to stay in the pocket. Vander Waal’s throwing motion is unique too. He almost always throws off his front foot with leg action resembling that of a baseball pitcher. It will be interesting to see if this is still the case after spending a redshirt year under the coaching of Brett Vigen. The QB battle will be the focus of spring and there is a chance we could see a winner announced after Wyoming spring football is completed. In the UW pre-spring football press release, Bohl said he would “…like to have our starter by the end of spring.” That statement puts Smith clearly in the driver’s seat to win the QB job. For Vander Waal to beat out Smith he will have to clearly be the better quarterback as the coaches are more than likely to go the conservative route. This may be a disappointment to Wyoming fans but the coaching staff does like Smith’s leadership ability and the fact he at least has some experience. It may not be successful experience as a starter, but a fifth-year senior is almost always going to have an advantage over a redshirt freshman. Smith could possibly take a big step in his development this spring and summer and rise to the occasion presented to him in his last college season with an opportunity to be “the guy”. Or we could see from him, what we saw in the two late-season losses last year that had fans incredibly frustrated with Smith and the offense. That scenario would open the door up for Vander Waal to win the job this spring. Let’s hope both QB’s push each other throughout this process. If Smith wins the starting job by default due to him being a senior, that could potentially be a bad sign for the Cowboys. 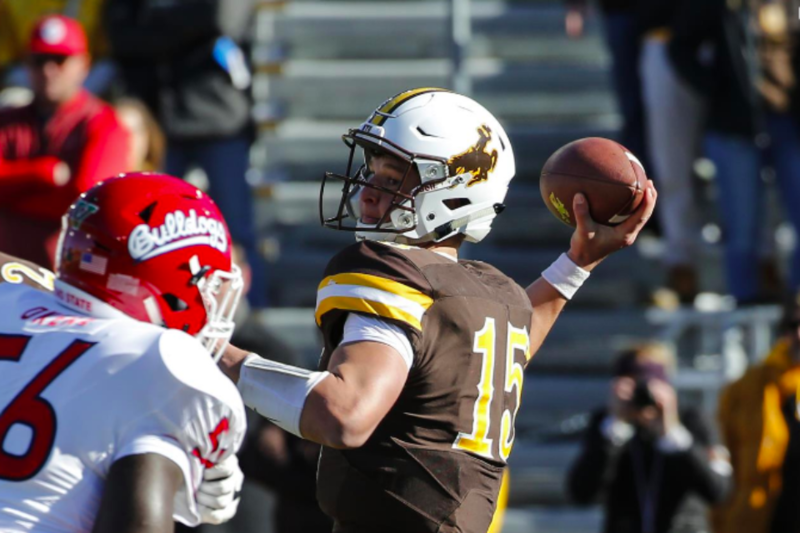 To get through a football season you need to have a quality starting and backup quarterback as Wyoming found out late last season when Josh Allen was injured. The opportunity has arrived for these two Cowboys. One a senior and one just starting his journey after a redshirt season. Who will step up? Hopefully, after April 21st when Wyoming spring football has finished, Craig Bohl and his staff will have their answer. While the QB position will be something certainly worth monitoring, there are other position battles that will be important to track as well. Look for another blog in the coming days breaking down other position battles in Laramie during Wyoming spring football.